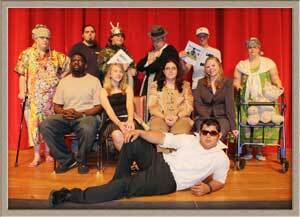 The Sentinel Upstage Players of North Florida Community College present “A Plot of Murder” on Friday, March 4 and Saturday, March 5 at 7 p.m. at NFCC’s Van H. Priest Auditorium. 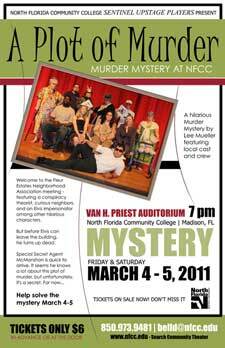 Tickets for this hilarious murder mystery are only $6 and available now – call (850) 973-9481 or email belld@nfcc.edu. Tickets will also be on sale at the door each night before the show. The play begins at a Fleur Estates Neighborhood Association meeting; the scene of several uproars. Lou Braunhorst, friendly neighbor and conspiracy theorist, has information that the quiet streets of the neighborhood will soon be sold and re-zoned for commercial development. He also believes that Black Helicopters are buzzing his house and transmitting signals through his satellite dish that put a "liberal spin" on all his television programs. But Lou's concerns do have validity - the rezoning, not the helicopters.